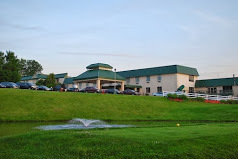 Set on 500 acres overlooking Cheat Lake, this golf resort is 8.5 miles south of the Pennsylvania border and 7.4 miles from West Virginia University. The relaxed, understated rooms feature cable TV, coffeemakers and free WiFi. Suites with views of the lake add living areas, wet bars and balconies. Amenities include 2 championship golf courses, a 40,000-sq-ft fitness center, an indoor pool and a hot tub. There’s also an 8,800-sq-ft spa and 2 on-site restaurants. The property regularly hosts weddings and events.